One of my long-term research interests as an archaeologist working in Asia has been the study of craft production—both the technologies and the social and political dimensions of the making of objects of everyday life. Most of my research has focused on ceramics, but in my fieldwork in Southern India I have also studied a range of other crafts: textile production, metallurgy, stone-working, and sculpting (and even performance). 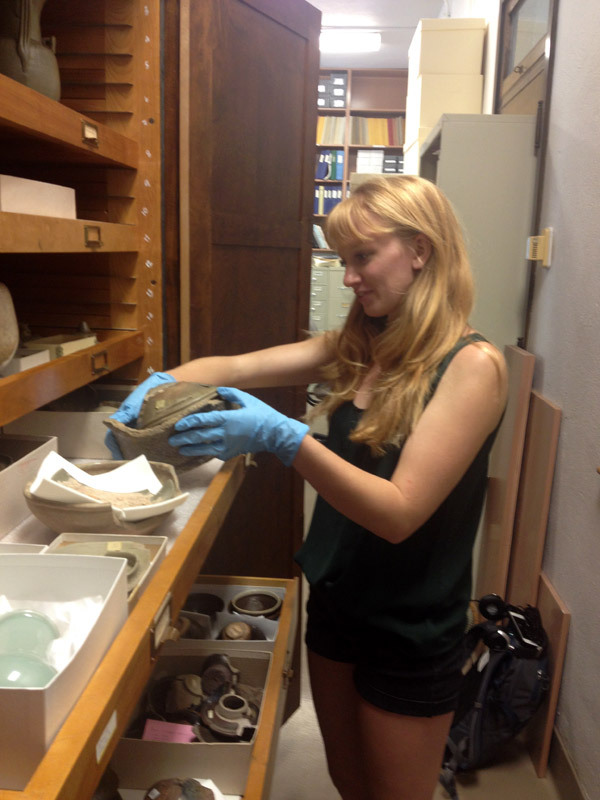 Archaeologists most often recover finished objects (albeit often in fragments)—the products of craft producers. Some of my most exciting discoveries have been of objects that failed in production—stone carvings that cracked and broke before completion, ceramic vessels that warped in the kiln and were never used. It is through objects like these that we get glimpses of production in process. We can examine ancient technologies "at work" while we empathize with the frustrations of the crafter whose work failed. Among my favorite collections in the collections of the Asian Division of the Museum of Anthropological Archaeology is a collection of ceramic "wasters," or failed ceramics, collected at Chinese kiln sites in the 1930s by James Marshall Plumer (who later became a professor of art history at U-M). 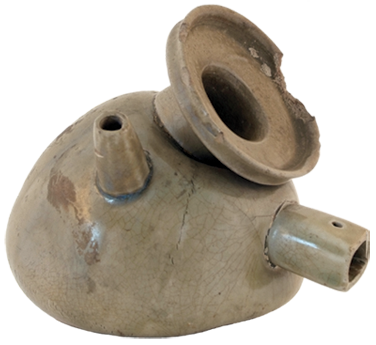 Our Plumer Collection (there is also a Plumer Collection in the Museum of Art) contains more than 4000 ceramic vessels and sherds, including several hundred wasters. One waster in particular was the inspiration for this exhibition. I have loved it since I became curator of UMMAA's Asian collections 23 years ago. 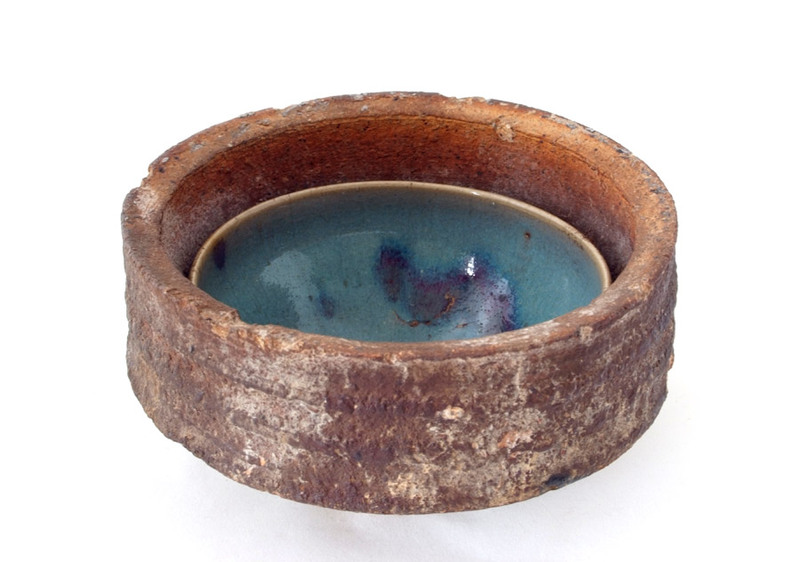 This elegant blue Jun Ware tea bowl fused to its coarse container in the kiln more than 700 years ago, never to be separated. The result is a failure, but one I find both informative and beautiful. About three years ago, I found myself thinking again about this object and the possibility of creating an exhibition in which it could be featured. I was well aware that not everyone finds old broken ceramics as fascinating as I do, so needed a hook for an exhibition that others might be interested in. The title, "Less Than Perfect," came next—why not an exhibition about imperfection and failure? We all experience it; we all worry about it; if we are wise, we all learn from it. With a key object and the "big idea" in place, I proposed the exhibition to the Kelsey Museum (since my museum lacks exhibition space) and, happily for me, they accepted. 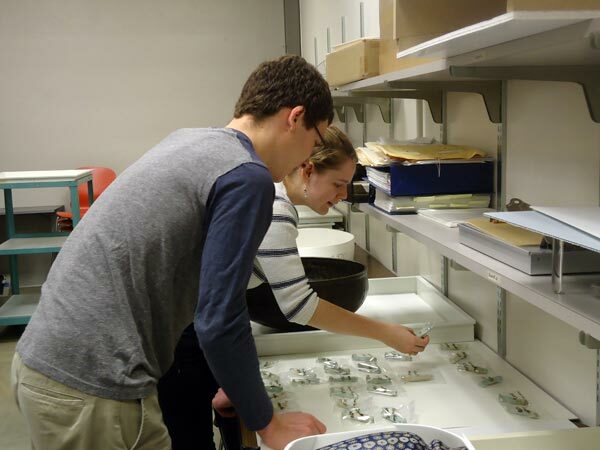 I next sought help from the ultimate perfectionists: U-M undergraduate honors' students. Six first-year students from the LSA Honors Program students responded to an invitation to help develop the exhibition. We held our first focus group in fall 2014 with Abrielle Cacciaglia, Danielle Colburn, Amelia Fuller, Eliana Herman, Maggie Johnson, and Ben Weil and Kelsey Educational Outreach Coordinator Cathy Person. At that initial meeting, we identified key themes for the exhibition and discussed what we liked, or didn't like, in museum exhibitions (we like maps; we dislike technology for technology's sake). Three members—Amelia, Maggie, and Ben—stayed with the exhibition beyond that first gathering, and over more than two years became key partners in all stages of the work. They selected objects from the collections of the Kelsey Museum, Museum of Anthropological Archaeology, and Museum of Art. They drafted (and redrafted) label text. They discussed and approved exhibit layout, design, and color scheme; and they helped plan the key events that would accompany the exhibition. As we got to work, failure (and its benefits) seemed to be everywhere: a special issue of the New York Times Magazine ("Failure", November 12, 2014), the well-received book Failure: Why Science is so Successful by Columbia University biologist Stuart Firestein (2015), countless self-help books on the value of failing (just do a key word search on failure on Amazon), and the storytelling event Failure:Lab, which I was introduced to on public radio. Failure was also popping up in other museum exhibitions, academic conferences, and art installations (e.g., the Science Gallery at Trinity College in Dublin, the Sam Fox School of the Design and Visual Arts at Washington University, the inaugural exhibition "Unfinished" at the Met Breuer, etc., etc., etc.). We were definitely on to something! Developing an exhibition is a long process, involving many people. We have had a great time bringing this exhibition to the Kelsey Museum. We hope that visitors to the physical exhibition and this website enjoy Less Than Perfect as much as we have enjoyed the work of creating it. Exhibitions are team efforts. The Less Than Perfect team includes our dedicated undergraduate partners, Amelia Fuller, Maggie Johnson, and Ben Weil, who worked for two years on all aspects of this exhibition from conception to opening; and Danielle Colburn, Abrielle Cacciaglia, and Eliana Herman, who were with us in the first year. I also thank the University of Michigan Museum of Art (UMMA) and Museum of Anthropological Archaeology (UMMAA) and their staff for the loan of many of the objects displayed here. 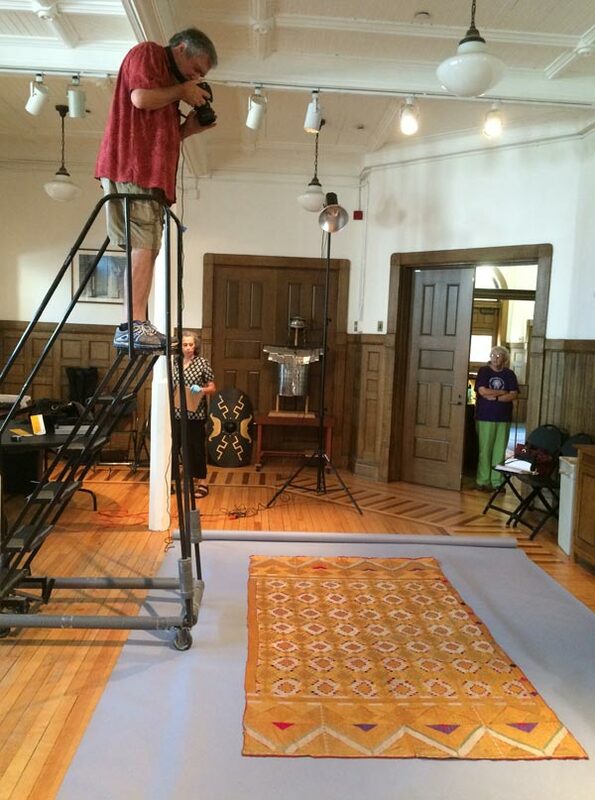 Kay Clahassey designed the exhibition logo and promotional material and Elizabeth Noll provided editorial assistance. Julia Falkovitch-Khain developed the accompanying web exhibition. The College of Literature, Science, and the Arts and the University of Michigan Office of Research provided financial support for exhibition programming. My deepest thanks to the entire Kelsey Museum staff: Sebastián Encina, Carrie Roberts, Suzanne Davis, Sarah Mullersman, Dawn Johnson, Chris Ratté, and, especially, Scott Meier and Cathy Person.